Our Rapid Advanced Detection and Response® (BTB Security's RADAR®) is a managed detection and response service (MDR) that combines advanced monitoring and detection technology with skilled expertise for accelerated incident response to reduce blind spots and false positives. RADAR is a powerful component for your defensible security program. It offers a comprehensive alternative to traditional monitoring or services by delivering highly actionable, verified information. No investment in infrastructure is required. You can now avoid cobbling together expensive and complicated tools, resources, and processes—and benefit from a single solution. Traditional security monitoring, intrusion detection, and antivirus do not cut it anymore. They are often overpriced and difficult to implement, and require extensive training and dedicated resources to properly monitor and maintain. Additionally, these traditional solutions only cover critical assets, not everything in your infrastructure. 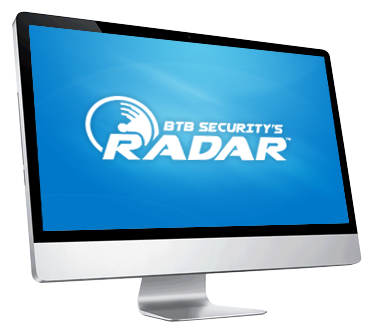 BTB Security's No BS (Blind Spots)® approach to MDR ensures complete visibility, the basic tenet of a comprehensive detection and response service. RADAR delivers detailed relational information to draw factual conclusions and respond with laser focus. It records and maintains everything. Want to see the value RADAR firsthand? Let an information security expert show you.